Julia Williams is a fabulous author of women’s modern fiction. The Summer Season is her fifth book and is definitely as good as all of the others she has written. She has the knack of writing lively entertaining stories and creating characters that you will like and believe in. The Summer Season tells the story of three people who live in the quiet village of Heartsease on the South Coast. First there is Joel, struggling to bring up his young son Sam after the sudden death of his wife Claire. Then there is Lauren who has needed to develop a wisdom beyond her years after her partner Troy literally abandoned her in the labour ward as she was about to give birth to their twin daughters. Finally, there is Kezzie who has found a refuge in the quiet village after her partner Richard fails to forgive her for one mistake and refuses to have any more to do with her. They all seem to be nursing their own broken hearts but at the same time they can find solace in the friendship and kindness offered by the others. The three are also brought together by their desire to improve the village and in particular the Memorial Gardens which is often subjected to vandalism and neglect. This involves helping to organise the Summer Festival as well as Kezzie working to restore a knot garden which was originally created by Joel’s ancestor, Edward Handford in the late eighteen hundreds. This delightfully leads into a different story line as they piece together the lives of the people who have lived in Joel’s home, Lovelace Cottage, before him. This is quite a moving and tragic story as Edward’s marriage to his wife Lily was often blighted with sadness although there was also a great deal of love between them. The stories in the past and the present interweave very well and both are equally absorbing. 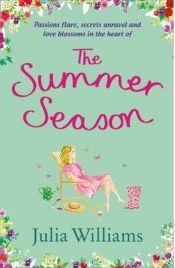 The Summer Season is a lovely light read that I was most reluctant to put times. I was really drawn in to both stories and it was fascinating to observe the differences between modern and old fashioned courtship. It definitely seemed to me that things were a lot less complicated in the days before mobile phones and Facebook where it is easy to misconstrue intentions. I really liked all three main characters and could sympathise with their individual situations. However, I was at times frustrated by some of the choices they made especially when they failed to communicate with each other about what they were thinking and feeling. As I was reading, I was continually hoping that things would turn out well for all of them. There are also a host of other minor characters who all contribute to the stories in their own ways and often bring a little bit of humour as well. The Summer Season really is a lovely book and one that I would heartily recommend. I think that it would also have a particular appeal to those who know a bit about gardening and also for people who are interested in tracing their family history. Overall it’s a very enjoyable read. With thanks to Avon for providing a free review copy. No Comments on "The Summer Season"
« You’ve Gone Too Far This Time, Sir!